Get your running shoes on—chasing purple squirrels is about to get a whole lot more intense in 2017. That is, unless you know exactly what it is that attracts the elusive top talent. More than half of TA leaders say their team’s hiring volume will increase with success measured by how long a new hire stays at the company, hiring manager satisfaction, and time to fill. Despite higher quotas, most recruiting teams won’t grow in 2017. Proven over and over again, the surest route to quality hires is employee referrals. So, it should come as no surprise that more companies now are developing strong referral programs. 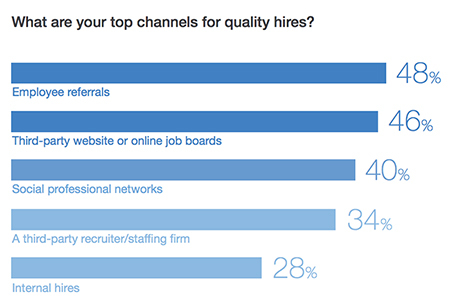 According to the global TA leaders surveyed, 48 percent admitted that employee referrals is their top channel for quality hires. It makes sense since those making the referrals know their reputation is on the line, so will therefore, ensure that the person they’re recommending is a good fit for the role. Don’t forget: it’s one thing to have a program in place, but quite another to have something that yields successful hires. Read about how LinkedIn does it here. LinkedIn’s report found that 80 percent of talent leaders believe employer brand has a significant impact on the team’s ability to hire. Despite this, most recruiting teams’ budget spends only a small portion on employer branding and referral programs. Conversely, the bulk of the team’s budget goes to traditional tactics, like job postings. Why? Because it’s hard to measure employer branding ROI, meaning a causal effect between quality hires and branding efforts is difficult to pinpoint. Additionally, most companies don’t know where to start when it comes to branding. 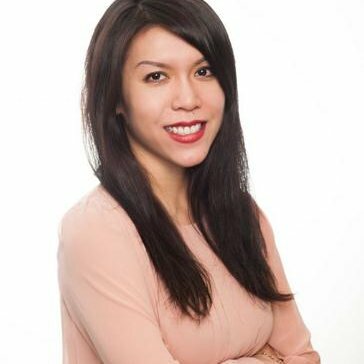 If you’re stuck in this stage, no worries—Lars Schmidt, co-founder of HR Open Source, created a checklist here of employer branding tools that you can start implementing today, which includes efforts like culture and employee blogs, candidate experience, and even enhanced job descriptions that weave in employer brand and values. What are some of the top channels to promote and measure employer branding? LinkedIn found that a company’s website and social media are still the best ways to reel in top talent. Developing a strong employer brand takes a lot of work, from social media channels to asset production, and recruiting teams can’t do it on their own. 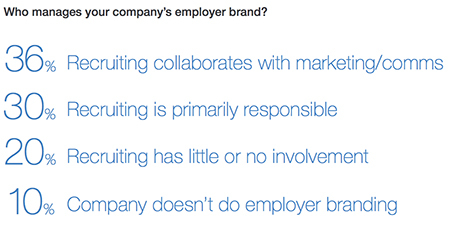 Still, 30 percent of recruiting teams are primarily responsible for their company’s employer brand, according to LinkedIn’s report. In 2017, consider partnering with marketing, as they know best how to craft messages that you’ll want communicated to prospects and future hires. When considering a potential employer, the most important information to candidates is company culture and values, followed by perks and benefits, then mission and long-term vision. This proves company culture is crucial when it comes to standing out from your competitors. Candidates want to see themselves working—and belonging—in your company. Without a defined culture, it’s hard to see that. Give top talent a chance to imagine themselves at your company with a careers page that shares the important information top talent wants, like culture and values (Read more about careers pages in 9 Things You Should Be Doing on Your Company’s Careers Website). If you’re going after top talent, get ready to talk about what the company can do for them. In other words, the deciding factor for these top candidates usually isn’t perks or benefits, but rather, “career advancements and how stimulating the job will be (both financially and intellectually),” found LinkedIn’s report. This is a great reminder that career advancement and a “tours of duty” concept should be a vital component in employer branding and company culture (Read more about the tour of duty concept).